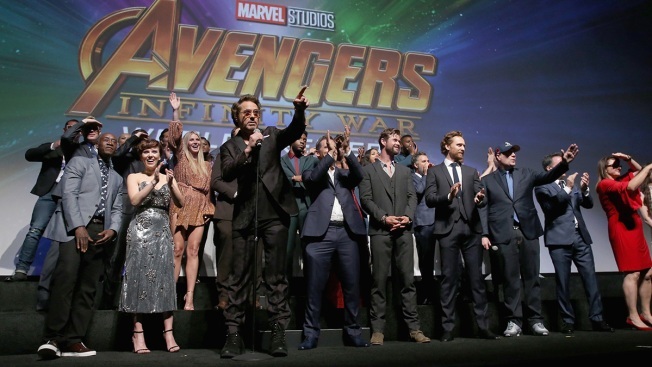 The three day Marvel movie marathon starts Tuesday, April 23, and ends Thursday with an advance screening of "Avengers: Endgame"
Robert Downey Jr. and cast & crew of 'Avengers: Infinity War' attend the Los Angeles Global Premiere for Marvel Studios' "Avengers: Infinity War" on April 23, 2018, in Hollywood, California. Whether you are a Marvel super fan making sure you didn't miss any clues, or a new superhero enthusiast looking to catch up, a movie theater in Revere is offering Boston comic book fans a chance to watch all 22 Marvel movies before the premiere of "Avengers: Endgame." Showcase Cinema de Lux Revere is hosting a three day marathon starting Tuesday, April 23 and ends Thursday, April 25 with an advanced screening of the new film at 5 p.m. The showing will start with "Iron Man" at 11 a.m. on Tuesday and will run straight through both nights, so only slightly less time than Captain America spent in the ice. In the case that you are not feeling so good, the theater will offer shower stations, phone charging stations and has planned meal breaks for guests, who will also save 22 percent on all concessions, though they probably do not offer schwarma. They will be showing the films in their XPlus auditorium which boasts of fully powered recliners and the most advanced laser projection so that you can see all of your favorite characters disipate into dust in high definition. Guests are welcome to wear costumes, but unfortunately the theater does not allow masks or weapons, so you will not be able to don your Iron Man mask or hang out with Thor's hammer. Tickets are $90 and can be purchased online.